You will enjoy either owning or gifting this unique and original gift to any Magic the Gathering fan. This wallet is all about fun. If you are a Magic the Gathering fan, carrying it with you all day is a bonus. This is the perfect gift for your boyfriend's or girlfriend's birthday, or for an anniversary gift. It is guaranteed to make the recipient go bananas because of its uniqueness. He/she will never see another wallet like this one again. Especially, if you have it monogrammed for free. So if you have a diehard Magic the Gathering fan to buy for, this is your best bet for a memorable gift. If you need help with personalization, just ask! I have a fair amount of geek cred and am happy to offer good suggestions. :) I cut out the shape, carved the design, and hand stitched it. No machines were used. Just me and my hampering cats in my little craft shop. 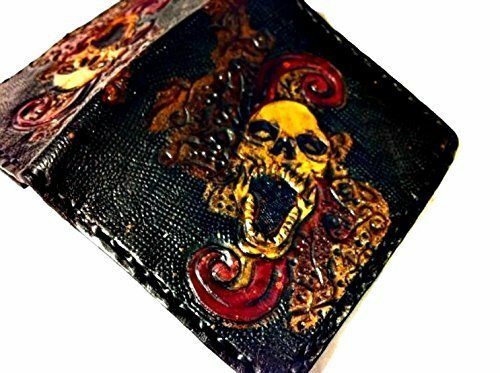 This wallet will last you a lifetime and it will get more beautiful with age. How many things can you say that about? With regular use it will develop a burnished look and will mold to the shape of the pocket you keep it in. It has an interior that will hold lots cash or in this economy...scraps of paper. Your cards will fit snugly in each slit. It will comfortably hold 4 cards but if you don't mind prying them out you can get 8 in. Leather stretches so eventually it will become easier to take them out and put them in. **Since this item is "made to order", the item you will receive will be similar to this one but there will be some minor differences. I am happy to send a photo of your item before shipping, upon request. View More In Wallets, Bag Accessories & Pocket Accessories. If you have any questions about this product by World of Leathercraft, contact us by completing and submitting the form below. If you are looking for a specif part number, please include it with your message.